Here’s a little something I threw together today, using the Outdoor Survival map as inspiration. 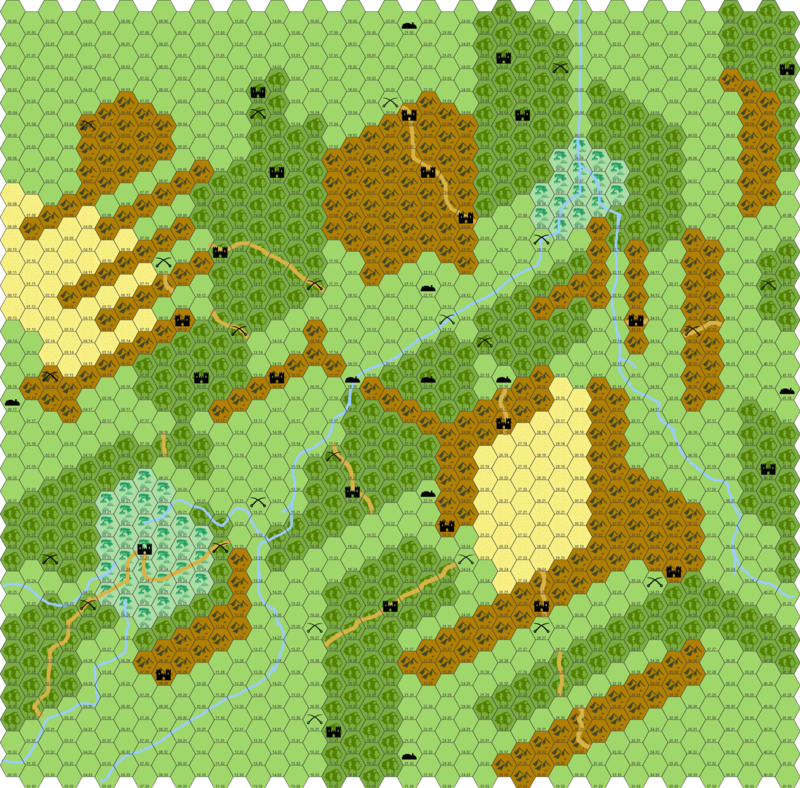 The idea is to use it as a campaign map for some kind of Braunstein style wargame. However, looking at it now, I think it’d make a good point-crawl West Marches style map, too. And here’s the Hexographer file, for those who have the program and want to play around with the map: outdoorsurvivalmap (not sure if this file works with the free version of Hexographer). The crossed swords can represent special encounters, monster lairs or mini-dungeons. My intention is to modify the basic Outdoor Survival map for different settings/genres, but I wanted to have a ‘pure’ version of the map to work off of. Also, please note the map is not perfect. My counting was off and the last column of hexes is missing on the eastern-most edge of the map. From what I can tell, Hexographer doesn’t have a way to add rows or columns to an existing map, and I didn’t feel like starting over from scratch for a single column. I can live with it; I hope you can, too. HeroQuest + Outdoor Survival Map = Awesome? I’ve recently (as in today) gotten nostalgic over Milton Bradley’s old dungeon-crawl board game HeroQuest. It was one of the first miniature dungeon-crawl games, and as far as I know, the first to offer quality 25mm miniatures in the game at a reasonable price. The rules were very simple but allowed a great deal of flexibility and expandability. Re-reading the rules, it struck me that HQ comes within striking distance of being playable as an actual role-playing game, not just a dungeon-crawler. And then I had an interesting idea: what if you combined HQ with the Outdoor Survival Map from the OD&D days of yore to create some kind of quasi RPG campaign world? Come up with a simple character progression system akin to leveling, expand the HQ Armory a bit, and you could have a simple but quite functional D&D-esque RPG or, alternatively, a free-form HQ campaign where the players choose which quest to do next. True, it would have a strong combat emphasis, but the rules would be vastly simpler than most combat oriented RPGs of today (such as 4E or Pathfinder). And the simplicity of the rules allow for easy tinkering so you can add just the right amount of complexity to suit your gaming table. There’s a wealth of fan-brewed content out there for HQ, plenty of material to adapt to an RPG campaign. You’d have to come up with some kind of wilderness tiles for outdoor encounters, but affordable options exist (such as this from 4E). You could probably adapt the original encounter tables from LBBs. The castles on the Outdoor Survival Map can represent the various HQ dungeons. Between the official quests, third party and homebrew there are probably enough to fill every castle.